SPC (Synthesizable Programmable Core) is a soft FPGA core that is fully integrated into standard design flows and that allows the seamless implementation of generic RTL programmable logic in ASICs and SOCs. 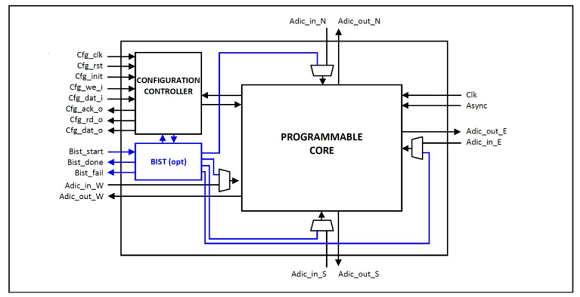 A configuration controller for the interaction between SOC and FPGA system functions such as the loading/checking of the bitstream. A Built-In Self-Test for industrial grade manufacturing testing or in-system self-testing. Configuration Control interface. On the fly bitstream decompression and decryption. High granularity partial reconfiguration. express written permission of Design And Reuse.